We can offer you a high quality performance so-called Bike trial show which is full of adrenaline and fun. You will be a part of a show with Tomáš Eibl (9th place in European Championship) usually supported by spectators and pleasant music. It´s a bike trial exhibition of everything a man can perform on a bike. Every single show is unique and has its own special atmosphere. 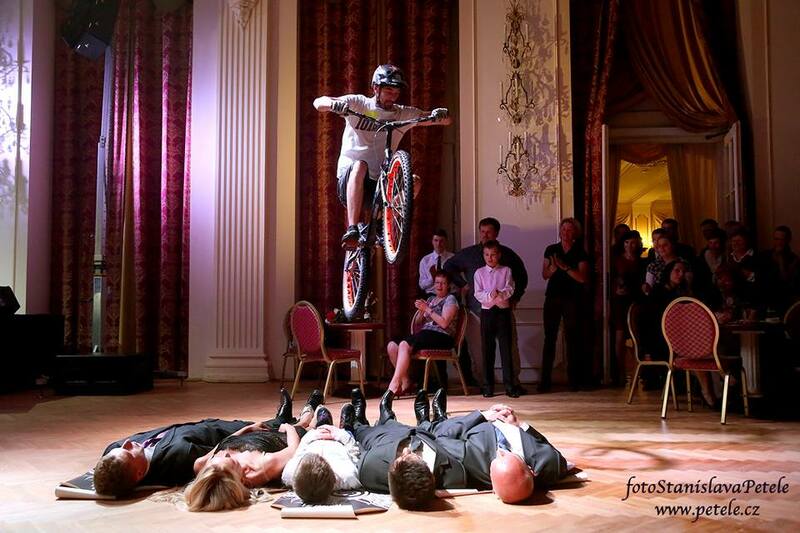 I am not only jumping high and far with my bike but I want my audience to be immersed into my show as well. I want them to feel adrenaline that I have in my blood during each of my jumps. It´s experience that´s worth being passed on. Do not hesitate to invite Tomáš for a sport event that you are about to organise. 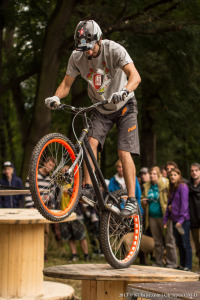 The Bike trial show can attract more visitors and Tomáš, nicknamed Žoržo, always proves to heckle his audience to vigorous reactions. You can expect an original show full of adrenaline and extreme jumps. Zašlete nám detaily Vaší sportovní či exibiční akce. Rádi s vámi navážeme spolurpáci. Different kinds of social events. 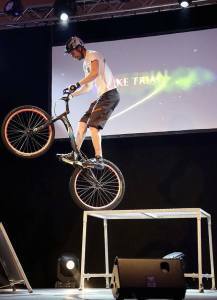 The Bike trial show can present unconventional experience of every social event. 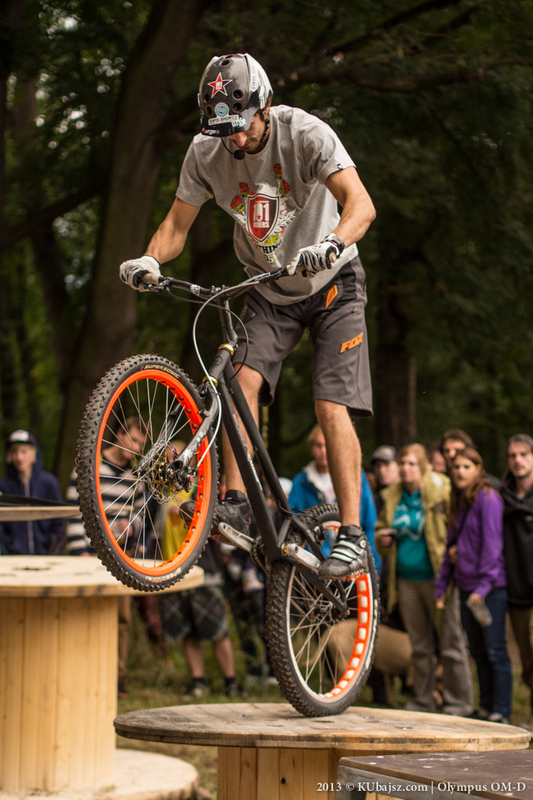 Except being a great bike trial rider Tomáš Eibl is also a perfect question master. He always engages the audience in his show and that is a guarantee of adrenaline rush. We can adapt the length of the show and we will do our best to meet your demands of the bike trial show. Tomáš is really flexible and has no problems to adjust the show for your audience. Have you started to organise your prom? Are you searching for some exhibitions to make this unforgettable evening even more entertaining? Do not hesitate to contact Tomáš. He has regularly performed his show on social events including the proms. Moreover he can provide an excellent moderation show for your ball as well. Book a date for your bike trial show in advance. A reservation takes only 2 minutes. 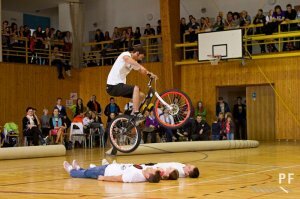 A Bike trial show for children at elementary schools, high schools or grammar schools. This 15-20 minutes long bike trial show can address not only to pupils but also their teachers. Tomáš is a good example proving that if you really want you can fullfil all your dreams. Tomáš ´Žoržo´ Eibl can show you his skills either on prearranged barriers or he can meet your special demands. His show is suitable especially for social, promotion and sport events (exhibitions, anniversaries, promotions, fashion shows, open days, etc.). During his performance you will watch for example jumping up on 110cm high obstacles or jumping down from 2,5 metres and one of the audience´s most favourite tricks which is jumping over volunteers lying on the floor. The shows are very action and witty being exceeded by their versatility and possibility to improvise. Basically, there are no space limits and the interaction of the moderator with audience is usually really attractive. Various kinds of obstacles can be used to enhance the show. The only limiting factor for creating and organising the show itself is the customer and his demands and wishes.